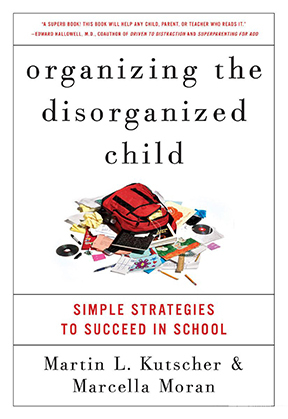 Organizing the Disorganizing Child is a superb book! Blessedly brief, pointedly practical, and clear as glass, this book will help any child, parent, or teacher who reads it. Step by step, the authors, who truly know their subject, lead the reader through a method that can’t help but succeed. This book meets an urgent need. I will be referring my patients to it. Yes, Organizing the Disorganized Child is packed with immensely helpful suggestions, but its value goes far beyond that. By revealing how the root causes of disorganization are not the fault of the parents, the teachers, or even the kids, but have to do with how the frontal lobes of the brain develop, this book will guide us to much more constructive solutions. Organizing the Disorganized Child is a long over due ‘manual’ that strives to make life easier on families with children with ADHD. Unlike other books that offer a menu of one-size-fits-all strategies, this book digs deeper and helps parents to understand the root causes of their particular child’s disorganization…This book is a MUST HAVE for all parents of children with or without ADHD! Organizing the Disorganized Child is a breath of fresh air. Straight forward, practical and most important providing strategies and ideas that any parent – even the disorganized – can easily implement. Rather than wait till some children struggle I suggest that Organizing the Disorganized Child be essential reading for parents of all entering first graders.